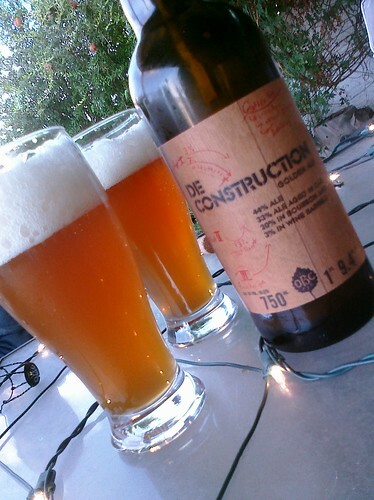 [caption id="" align="alignleft" width="374" caption="De Construction by Odell Brewing - Evo Terra on Flickr"] [/caption]I like beer. Good beer, you understand. Beer where a brewer had an intent beyond producing a lowest common denominator swill that would be consumed the world over. I live in Phoenix. Sometimes I get sick of the heat, but by and large, I enjoy this city. My friend Rob Fullmer has a new project that blends those two nicely. It's a new blog; Beer PHXation. Rob and Dave are just getting started, but they're already carving out a niche for themselves. Both are active and talented homebrewers, and champions of many of the Phoenix-based craft breweries. They recently released a "manifesto" of sorts, aimed at Arizona Restaurant Week. The issue? Loads of attention paid to wine lists of mentioned establishments -- but beer was an afterthought. They wrote about the subject much more cogently than I would have. It's worth a read. So kudos, Rob. Keep 'em coming! There's a lot of beer-related happenings in this town. Thanks for showcasing all of it! I've always considered myself a sort of amateur astronomer. Blame it on Mom, who kept me up late watching the meteor showers from the hood of the car when I was a wee lad. My friend Dr. Pamela Gay makes it easy for would-be stargazers to do more than simply look up at the stars. She's one of the brains behind Galaxy Zoo. Think SETI@home, if you recall that project, and you've got the basics of this. You, the person reading this because you have nothing better to do with your time, can help forward human-kind's collective intellect by looking at pictures taken by the Hubble telescope and helping classify the astronomical objects shown. No PhD required! Sound cool? It is cool. Very, very cool. [caption id="" align="alignleft" width="300" caption="Hanny & the Mystery of the Voorwerp"] [/caption]And sometimes, that cool becomes something even bigger than before. That happened when school teacher Hanny van Arkel discovered a strange blob of glowing gas in one of the images she was analyzing through the Galaxy Zoo interface. She brought this strange blob to the attention of the project scientists, and for the past 3 years astronomers have been using telescopes around and above the Earth to try and find out what it is. They now think Hanny's discovery, which she called a "Voorwerp" (Dutch for Thing), is the first known light echo of a quasar. The significance of that may be lost on you at first. It was for me. But with the help of smart people like Pam and Phil Plait, I've come to understand why it is, in fact, so cool. But not everyone has an astronomer in their back pocket. So Pamela and crew decided to take an odd turn in their educational outreach programs: comic books. Her team received funding to write a comic book telling the story of Hanny's discovery and the subsequent adventure in understanding it. That comic book will premier at Dragon*Con on Sep 3, 2010 (10pm Crystal Ballroom of the Hilton), and will be available for digital download on their website. I can't go to Dragon*con, but I will be watching the event, thanks to the magic of the interwebz. You can too. Either directly from UStream, or from the webcomic's page. See you there. Don't hog all my bandwidth. And go join Galaxy Zoo. Helping forward the cause of science, reason and understanding seems a might more worthwhile than fertilizing non-existent crops.